Triple-A baseball teams have the most consistently interesting rosters, as in addition to prospects working their way up the ladder, one finds all manner of road-tested baseball veterans. The Oklahoma City RedHawks presently boast active Minor League home run leader Mike Hessman, who has spent parts of five seasons in the Major Leagues. And, in a decided change of pace, the 34-year-old slugger spent last season in Japan as a member of the Orix Buffaloes. "Baseball there is definitely different. 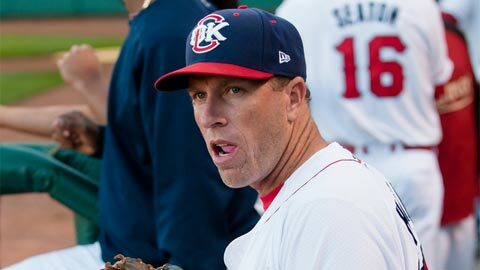 It takes some getting used to," said Hessman, speaking in the RedHawks dugout prior to Thursday evening's ballgame. "And they cheer. Boy, they've got some crazy fans. Each team has a band and they have different songs for every hitter." And not just the atmosphere is different. "You see more off-speed stuff over there, they don't throw as hard as they do over here," he said. "There's more change of speed stuff, and they throw a lot more splits." Hessman hit .192 over 48 games with Orix and, alas, wasn't asked back for 2012. "I would have liked to stay over there and play another year," he said. "Having a better understanding of how to go about my business, about what to expect and what to go through would make it easier that second time around. But it didn't work out and that's fine. I still know I have couple good years left in me. ... I'm going to keep playing until they tell me I can't. It's been fun." Hessman isn't the only RedHawks player with a recent excursion to Asia on his professional resume. Right-hander Brian Bass, 30, began the year in the starting rotation of the Korean Baseball Organization's Hanwha Eagles. "It's been a goal of mine for a few years, to play over there and see what it was like," said Bass, who has pitched in 101 Major League games. "I wanted to get away from Minor League Baseball for a little bit, see what international baseball is all about." What it's all about, he found, is small ball -- and lots of it. "There was a lot of singles, and a lot of stealing," he said. "I didn't have a lot of success, and ended up going to the Minors over there. I didn't have much of a chance to play and ended up getting released. I knew going in that this would be one of those deals where if I didn't get off to a great start I'd end up going home. The writing was on the wall. You don't get a lot of second chances, but it is what it is." But Bass didn't stay unemployed for long. Just two days after arriving back on American soil, the Astros organization called and offered him a spot in the RedHawks rotation. He's made two starts thus far, picking up a win and compiling a 5.17 ERA over 15 2/3 innings pitched. But despite the difficulties he encountered in Korea, Bass said he would certainly entertain the notion of going back to Asia. "I didn't have a bad time out there," he said. "I'm definitely not opposed to it." After storming their way through the first three rounds of the playoffs, the Oklahoma City Thunder have made it to the NBA Finals. But they're not the only Oklahoma City entity that's on a tear. The Thunder have gone 8-0 during the playoffs at home in Chesapeake Energy Arena, located amidst the former warehouses that now make up Oklahoma City's Bricktown entertainment district. In that same span, the Pacific Coast League's Oklahoma City RedHawks have posted a 16-2 mark at nearby Chikasaw Bricktown Ballpark. This includes a franchise-record 14-game winning streak, one that dates all the way back to May 10. The RedHawks haven't necessarily been dominating the opposition, as they've only scored 28 more runs than their opponents during the streak. But whether it's via the power of Mike Hessman, the on-base prowess of Scott Moore, or the lights-out relief work of Jose Valdez, they just keep on finding ways to win. But is anyone noticing? RedHawks president, Michael Byrnes, acknowledges that it can be difficult to capture the fans' attention during the NBA playoffs, but says "that just means we have to work a little harder." This work is done primarily by the team's 16-member ticket sales staff. Selling tickets in advance and focusing on group sales helps bring fans to the ballpark on evenings when they otherwise might have stayed home and watched the Thunder. "We had a sellout crowd here on June 2, a night when we were up against a Thunder home game," said Byrnes. "A lot of them were probably watching the Thunder on their iPhones, but they were here!"